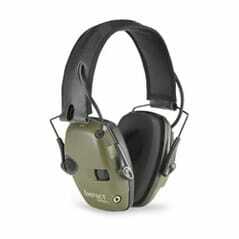 The Howard Leight Impact Sport Tactical Electronic Earmuffs provide 22dB protection while amplifying ambient sound to 82 dB attenuating impulse and continuous noise in harmful environments. This allows the user to clearly hear conversation or range commands while being protected from harmful sound such as gun fire. These comfortable earmuffs have an adjustable padded leatherette headband and fold up easily to fit in the included durable protective black hard case. The cups are low profile and add to the users comfort and clearance while shooting. Included is 3.5mm stereo auxiliary cable and 2 AAA batteries.